If there was any doubt left that Nokia's next Windows Phone would have a greatly improved camera, Microsoft erased it with a couple of Flickr photos. 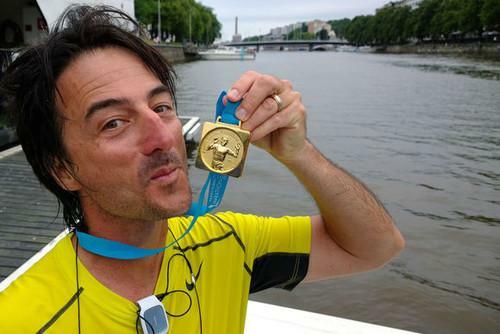 Joe Belfiore, Microsoft’s corporate vice president for Windows Phone. The photos came from Joe Belfiore, Microsoft's corporate vice president for Windows Phone, and were spotted by a forum poster on The Verge. Exif data from the photos list the phone's name as "Nokia Lumia 1020." Belfiore has now switched the photos' status to private. One, showing Belfiore is shown above. Nokia's next phone will almost certainly have a 41-megapixel camera, similar to the one that appeared in Nokia's 808 PureView Symbian phone last year. The most interesting thing about this camera is its ability to mimic a zoom lens by cropping its 41-megapixel photos down to smaller resolutions. That way, users can zoom in and still have a 5- or 8-megapixel photo, similar to photos taken with competitive smartphones. As The Verge notes, the two Flickr photos have different pixel counts--one at nearly 5 megapixels, another at 3.7 megapixels--suggesting that the Lumia 1020 will, in fact, be able to digitally zoom and crop to normal image sizes. 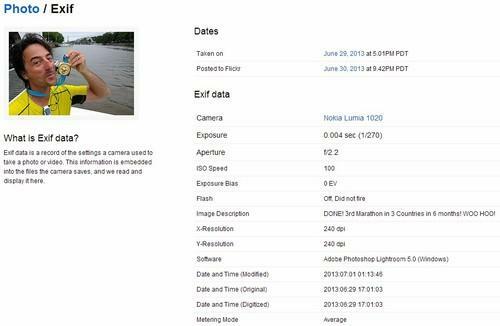 Exif information taken from the Belfiore photos lists the phone’s name as the "Nokia Lumia 1020." However, Exif data (above) also shows that the Belfiore sent the images to Adobe Photoshop Lightroom before uploading them to Flickr, so it's unclear how much additional cropping or editing he did. In any case, Nokia hasn't really hidden the fact that its next phone will have a 41-megapixel camera. An invitation to a Nokia press event in New York on July 11 claims that there are "41 million reasons to attend." Other rumored specs for the Lumia 1020, known in previous rumors as the Nokia EOS or Nokia 909, include a 4.5in display with resolution of 1280x768 pixels, a dual core 1.5 GHz processor, and 32GB of storage. If true, that means the phone will not take advantage of the upcoming 1080p display support in Windows Phone. An unconfirmed report claims that the phone is headed to AT&T in the United States, following in the footsteps of Nokia's Lumia 900 and Lumia 920. We'll find out for sure in a few days.